I’m not sure if the recording, made in Château Fallot, Salle de Musique, Lausanne is quite optimum for this kind of music. 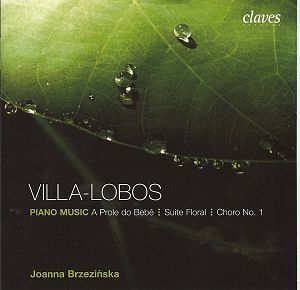 It tends to spread a bit and therefore can blunt some of Villa-Lobos’s crisper more detonatory writing but it’s otherwise good and I wouldn’t make too much of it in the light of the first class playing of Polish-born Joanna Brzezińska. She deals with the Suite Floral with athleticism and tonally expressive colour. Crucially she also characterises with flair and imagination, warm in the Summer Idyll, not afraid to shy away from the bass incursions of A Singing Country Girl. By the time she arrives at Joy in the Garden she is on top form, virtuosic and full of élan. The bulk of the disc is given over to both books of A Prole do Bebê and here we witness no falling off of laudable qualities. There’s clarity and passagework evenness in Branquinha, Paganinian glitter in Negrinha and plangency, verdancy and colouristic prism a-plenty in A Probrezinha. She manages to evoke a burnished, teaky tone for Bruxa, contrasting it with elastic treble tracery. In the second book she deigns, quite rightly, to stint the elation and danger of the music. Her O Comaundongo de massa is correspondingly vital and exciting and elsewhere we find a certain insouciance and darting Debussian eloquence (O Passarinho de panno). As an envoi I certainly enjoyed the way she plays with the Ragtime elements of Choro No.1 Tipico. Her rubati are clever and not self-regarding and she projects the piece with considerable accomplishment so much so, in fact, that I didn’t miss its original incarnation for guitar. As for competitors Sonia Rubinsky on Naxos splits both books of A Prole do Bebê between two discs but Alma Petchersky on ASV includes both, adding Poema Singelo, Idylio Na Rede and Alegria Na Horta. If you find Brzezińska insufficiently tensile and super-virtuosic you could try Hamelin on Hyperion CDA67176. He is always faster, sometimes remarkably so, than she is, and digs into the darker interstices of Book II more malignly. He’s so fast that we have time for an arsenal of makeweights including the important Rudepoêma.